ViewCast Corporation , a developer of industry-leading hardware and software for the transformation, management and delivery of professional quality video over IP and mobile networks, today announced they will be demonstrating the Niagara(R) 7500, their latest innovation in high-definition streaming, at NAB 2009. The Niagara 7500 is a powerful, feature-rich streaming appliance for Web-based delivery of high-definition video. 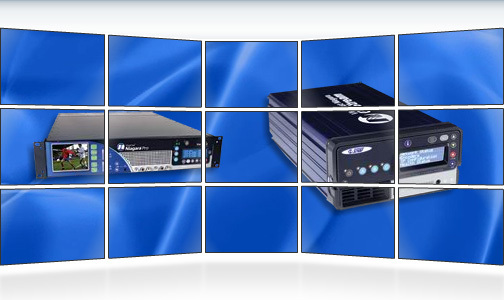 Designed for the most demanding professional broadcasting applications and other professional-level high-definition video distribution requirements, the Niagara 7500 is a complete plug-and-play solution that enables users to quickly capture and broadcast premium quality audio and video to IP and mobile networks in multiple formats and at multiple bit rates – all simultaneously. The Niagara 7500 is a high-definition video-streaming appliance that brings a new level of quality and performance to professional broadcasting applications. It offers a sleek, innovative touch control interface that streamlines and simplifies operation. A brilliant high-resolution widescreen monitor on the front panel displays captured video, and multi-segment LED meters and a headphone jack are provided for audio monitoring. The Niagara 7500 accepts standard or high-definition video through its SDI interface, and an SDI loop-out is provided to facilitate workflow. A key feature of its video processing capability is that it can switch-on-the-fly between standard and high-definition sources, without having to re-initialize the system. Audio inputs include analog stereo (balanced and unbalanced), two channels of AES/EBU, and eight stereo pairs of embedded SDI audio. The Niagara 7500 also comes standard with ViewCast SimulStream(R) technology, which enables a single video source to generate several video streams all at once, with each stream configured differently for laptops, cell phones, or mobile devices. It also allows simultaneous streaming in many popular formats, including Windows Media(TM), VC-1, Silverlight(TM), Flash(TM), H.264, 3GPP mobile and more. Closed-caption extraction and rendering, de-interlacing, and inverse telecine are standard on the Niagara 7500, as well as bitmap overlay, scaling and cropping. If its incoming signal is interrupted, the Niagara 7500 will even default to a standby message that can be customized by the user. Like all professional-grade ViewCast streaming appliances, the Niagara 7500 comes standard with Niagara SCX(R) Pro, which allows remote management of all the key features of multiple units in the same easy-to-use interface, over the network. There’s also an available SDK that allows users to customize their experience, or interface with broadcast automation systems for highly customized applications.